When you start an email campaign, it’s important to be data-driven. An experimental mindset will help you understand if you’re going in the right direction or if there is something different you can test to improve your results. 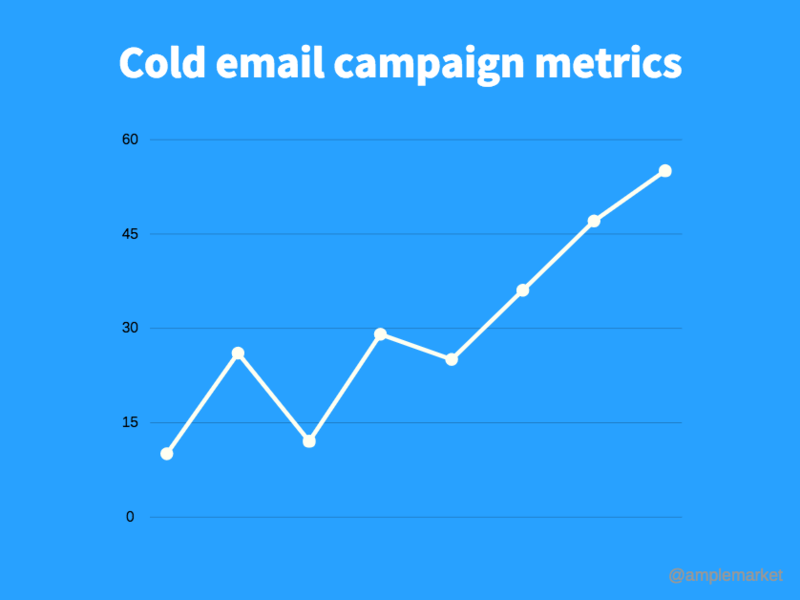 In order to measure the success of your cold email campaigns, there are a few metrics that you should keep an eye on. In this blog post, we are going to focus on the three main metrics and provide tips to help you increase those metrics. The open rate measures the percentage of people that opened your email (total opens/emails sent). It’s the variable you need to measure to know if your subject line and the first sentence of your emails are working. Have an accurate lead generation process. Make sure you are reaching out to the right person. You should send your emails to the purchasers, the decision makers for your product/service. Discover the ideal time to send your emails. It’s important to find the best time to send your emails. It usually depends on several variables such as the type of companies you’re reaching out to, their location, the job titles of the prospects (CEOs vs Managers) etc. Fridays and Mondays are not the best days to send cold emails; on Mondays, people have a lot of catch up to do, and they tend not to want to start conversations on Fridays. Tuesdays and Thursdays are good days to send your cold emails. Try to send them early in the morning or late in the afternoon. A/B test until you find the best time to send your email campaigns. Select a killer subject line. This is the key factor when it comes to the open rate. If you want your prospects to open your emails, you have to write a killer subject line. Keep it short, and avoid using spammy words. Write a good first sentence of your email. The first things your prospects see are the subject line and part of the first sentence of your emails. Be concise and personal in the way you start your emails. Raise your game with follow-up emails. When you send your first email, it may slip through the cracks in a cluttered inbox. That’s why you should be persistent and use your follow-up emails to catch the prospects' attention. The reply rate gives you the percentage of people that replied to your email (total replies/emails sent). The most important factor is the body of your email. You should aim at a reply rate that is half of your open rate (i.e. if you have 70% open rate you should have a 35% reply rate). Write a short and concise email. People have short attention spans when it comes to emails. Keep your message short and clear to increase the chances of getting a reply. Personalize your approach as much as possible. Personalize your emails with the use of dynamic fields such as first and last names of the prospects. You can also refer something they recently achieved (new featured launched, new partnership, new funding round). Avoid features, add value propositions. When you craft your cold email campaigns, put yourself in your prospects’ shoes. Avoid enumerating your product’s features, and focus on presenting a solution to a pain point they might be struggling with. Add a clear call to action. Adding a clear call to action at the end of your emails is very important in order to increase your reply rates. If you want to schedule a call, ask for 10 minutes of their time. If you want them to try your product and give you feedback, provide a link to a freemium. Reduce the decision making barriers and make it easy for them to proceed to the next step. The conversion rate is the most important metric to measure in order to see if your cold email campaigns are performing well. The conversion rate measures the percentage of people that converted to a given goal (i.e. scheduling a call, signing up for a free trial, clicking on a link, etc...). The main goal when sending cold emails is to turn cold leads into warm leads. You should aim at 10-20% of your reply rate. This is a good benchmark for conversion rates in cold email campaigns. It's a good number for a first call/demo, however if you’re offering a free trial maybe it should be even higher. The conversion rates are a combination of everything mentioned above: Prospecting, Value Proposition, Personalization, Follow-ups, Subject line, Call to action, Reminders. In this blog post, we shared the most important metrics that you should measure when sending cold emails. You should always A/B test every assumption, in order to guarantee the best results possible. If you have any questions or suggestions feel free to reach out to team@amplemarket.com. You can also follow us on Twitter and on LinkedIn. Amplemarket is your AI-powered sales assistant. Amplemarket takes care of everything from prospecting to outreach, follow-ups, and scheduling of meetings. You tell us who you want to reach out to and wait for meetings to magically appear in your calendar. Lesson Learned #4: Follow-up, Always Follow-up!